What is load cell TEDS? A platform brake tester has been developed to check the testing equipment used to assess the braking performance of vehicles at test centres. The braking performance of trucks is critical to road safety. Road transport authorities require vans and lorries or trucks to be checked on a regular basis to ensure their roadworthiness. An important part of this check is to test just how good the brakes on commercial vehicles really are. 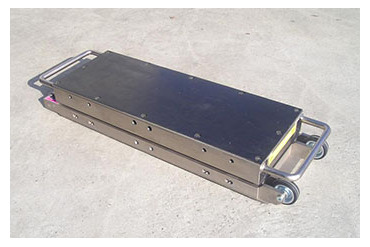 This bidirectional force transducer is designed to measure the horizontal and vertical reaction forces at the wheels of trucks during qualification tests of roller brake testers. To improve your experience on our site, you must accept the use and writing of cookies on your connected device. These cookies allow you to follow your navigation, update your basket, recognize you during your next visit and secure your connection.